The UK's legal situation would not currently allow a Brexit deal and an extension would be needed to make it happen, a Tory MP has said. 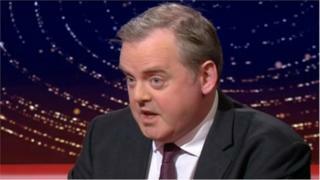 Guto Bebb said more time would be needed to pass legislation for a deal. Theresa May offered MPs a chance to vote for a short delay to Brexit in a speech in the Commons on Wednesday. It followed pressure from members of her own cabinet to avoid a no deal, which one Welsh Tory claimed undermined negotiations. On the current timetable the UK is due to leave the EU on 29 March. Speaking to BBC Radio 4's the World At One, Mr Bebb said: "Most people in [the Commons] know full well that even if the prime minister's deal was to be put in front of the house tomorrow and pass, we would still need an extension of article 50 in order to get the legislation that needs to be passed in order to allow the prime minister's deal to operate to be put in place. "The reality is that we're not currently in a situation where we can leave the European Union because our legal system is not currently in a situation where that can be done." On Tuesday the prime minister promised MPs a vote on delaying the UK's departure from the EU or ruling out a no-deal Brexit, if they reject her deal next month. Mrs May said she will put her withdrawal agreement - including any changes she has agreed with the EU - to a meaningful vote by 12 March. In the event that fails, a vote would be offered on whether the UK should leave without a deal, and then a further vote would be held on whether an extension to article 50 should be held. The move would mean that the UK would not crash out without an agreement on 29 March - the no deal scenario. The PM said an extension would not be beyond the end of June. But Plaid Cymru's Jonathan Edwards told MPs it would be the "political equivalent of swimming around in circles" if Brexit is extended but no deal comes back on the table later in the year. Welsh Leave campaigner and Clwyd West MP David Jones accused those in the PM's cabinet calling for an immediate extension of article 50 of "undermining the position" of the British Brexit negotiators. In the Commons, he asked the PM if she agreed "that talk from certain quarters of her government of immediately extending the article 50 process and taking no deal off the table are simply giving succour to our interlocutors in Brussels". The PM replied: "Simply extending article 50 does not resolve the issue of the decision this house will have to take." Labour Pontypridd MP Owen Smith said he was "delighted to welcome" the PM's "screeching u-turn", allowing MPs to vote against a no-deal Brexit. He asked if her government would be voting for a no deal or against it. The PM said she was getting conflicting views from the Labour side of the House. "One the one hand I'm told nothing has changed, on the other hand I'm told I've done a u-turn". Chris Bryant, Labour Rhondda MP, raised concerns that if the UK leaves without a deal there will be no deal on security, meaning police would not have access to information from the EU to tackle paedophilia. Stephen Crabb, Tory MP for Preseli Pembrokeshire, said "Isn't it still the reality, that the withdrawal agreement, warts and all, amend or not, remains the only serious show in town if we are to leave the European Union? "And does the prime minister think that if this deal keeps getting voted down by this house, that she will need to stand alongside the leader of the opposition, go on television and explain to the British public why this house is institutionally and politically incapable of delivering Brexit?" Plaid Cymru's Jonathan Edwards said it would be the "political equivalent of swimming around in circles" if Brexit is extended but no deal comes back on the table later in the year. MP for Carmarthen West and South Pembrokeshire Simon Hart had proposed tabling an amendment calling for a Brexit delay if a deal had not been passed by mid-March. The Tory MP withdrew the idea following the PM's statement. Brexit: Which amendments will be debated by MPs?